WE ARE PLEASED TO PRESENT OUR CURRENT EXCITING PLANT LIST. EVERY YEAR WE ADD NEW PLANTS THAT ARE OLD FAVORITES REDISCOVERED, OR NEW VARIETIES WITH IMPROVED FEATURES. LATELY WE'VE BEEN FOCUSSED ON DEER RESISTANT PLANTS. 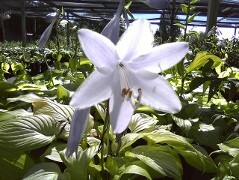 THE LIST OF PLANTS WE GROW INCLUDES MANY UNCOMMON AND HARD TO FIND VARIETIES. PLEASE ENJOY YOUR EXCURSION THROUGH THE LIST.WE ARE ADDING NEW PHOTOS ALL THE TIME. EVENTUALLY WE'D LIKE TO HAVE A PICTURE OF EVERY VARIETY WE GROW. These brief descriptions and pictures serve as an introduction to the pallette of plants we grow at our Southold N.Y. nursery. ¥ Achillea ‘Moonshine- 2', silvery foliage and rich yellow flowers, tolerant of more moisture than most yarrows. Good cut flower. Agastache 'Black Adder'- Giant Hummingbird Mint, 3', dark purple/blue flower spikes all summer, deer resistant, anise scented foliage. ¥ Alchemilla mollis-Ladie’s Mantle- 15"-18", delicately edged leaves, chartreuse fl. The Alchemist's Plant- if you wanted to turn lead into gold, an essential ingredient was water collected from the leaves of this plant. NEW N Amsonia tabermontane Blue Ice- 15"- 18", blue flowers over a long period late spring/summer. Deer resistant, drought and seashore tolerant. ¥NEW N Aquilegia canadensis-'Blue Star', Columbine, 15"-18", blue and white spring flowers, longlasting blooms, native and deer resistant, prefers shade, well drained, will reseed and colonize when happy. ¥Aruncus aethusifolia 'Noble Spirit'-, dwarf Goatsbeard, 10"-12", finely divided ferny foliage, white featherduster flowers late spring-summer, part shade. ¥ Astilbe ‘Visions’-15"-18", fragrant, raspberry pink plumes- flower, glossy compact foliage. NEW Coreopsis Polaris- profuse white flowered form of above. 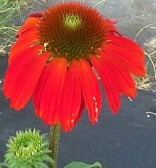 Echinacea purpurea- Purple Coneflower- 2'-3', sweetly scented purple flowers all summer, butterflies adore! Geranium Reynardi 'Tschelda'-6"-8"-grey/green felted leaves, blue spring flowers, dense spreading groundcover, deer resistant. 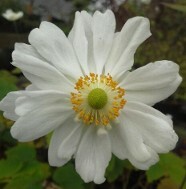 We first saw this in a garden in Vancouver and knew it would be a great addition to our plant list. flowers all season. Most floriferous of the hardy Geraniums. ¥ Heloniopsis orientalis- Japanese Swamp Amaranth- low evergreen rosettes, glossy wedge shaped leaves, lavender/purple flowers.Shade. Joan Senior- 18"-24", white flowers mid season. One of the whitest of Daylillies. 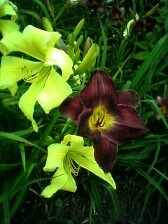 Joylene Nichole-15"-18", large rich pink ,piecrust edges, mid/late extended bloom, Popularity Poll daylily. NEW Hibiscus Cristi- 4'-6', deep red 9" blooms in summer, loves moisture. 'August Moon’-large golden puckered leaves. NEW Designer Genes- 12"-15" by 24"-30, bright gold leaves, deep red stems. NEW First Frost- 2010 Hosta Growers Association 'Hosta of the Year', 15"-18" ht. by 2'-3' wide, blue/green centers, gold/cream margins, sport of Halcyon. Francee-crisp white margin on lvs. NEW Gem Stone- 10"-12" ht., small blue/green leaves on smallish Hosta. Kroussa Regale-2’-2'1/2' ht., grey lvs., 4-5’ flower stalk, a unique variety. Media picta- 12"-15", old fashioned white centered Hosta, fast grower. NEW Night Before Christmas- 18"x36", deep green leaves, bold white centers. Stunningly crisp and bold. NEW Pineapple Upside Down Cake- 18"-24" ht by 3"-4" wide, long, rippled, narrow green leaves changing to gold centers with green margin. 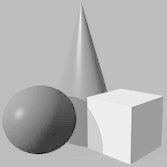 Fun and different. NEW Po-Po- a tiny treasure, soft grey leaves 4"-6" ht. NEW Rainbow's End- 12"-15"- by 18", unique variegated yellow and deep green foliage, stunning. NEW Rainforest Sunrise- 18"-24" by 2'-3' wide, smooth bright gold leaves. Regal Splendor- 3'-4', upright vase shape, large grey green leaves with golden edges, elegant sport of Regal Cross. Stained Glass- sport of Guacamole, 15"-18", huge bright gold leaves with dark green borders, sweetly fragrant flowers. 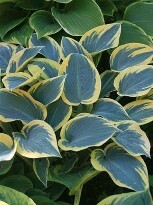 Sum and Substance-3'-4'x 5'-6' wide, giant Hosta, magnificent huge chartreuse leaves. Venusta-miniature, 4-6" mounds, free flowering, smallest of the small. Lespedeza-Pink Fountains, 4'-5', pink/magenta flowers late summer/fall, arching habit,glorious in the fall. 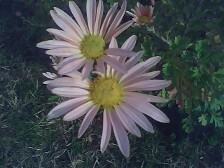 Leucanthemum(Chrysanthemum) ‘Becky’- 3'-31/2', large white daisies all summer, needs no staking, great cut. Liatris- 'Kobold'- Gayfeather, 2'-21/2', fuzzy purple flower spikes midsummer, drought tolerant. Lychnis coronaria, Rose Campion- 2'-3',bright and bold magenta flowers over grey, felty foliage, from grandma’s garden, dry sun/part shade, deer resistant. ¥ Perovskia atriplicifolia-Russian Sage-fragrant grey leaves, blue flowers all season, deer resistant. Phlox paniculata-‘Superphlox’-white flowers, absolutely mildew proof, our own discovery, we're building our stock back up again after accidentally nearly selling the last plant. Physostegia-False Dragonhead- 3'-4', pink flowers in September, vigourous selection. Platycodon ‘Sentimental Blue’- Dwarf Blue Balloon Flower,12"-15" , small plant but huge, deep blue blooms, all season. Rudbeckia ‘Goldsturm’-Black-eyed Susan-masses of golden-yellow daisies all summer into fall. 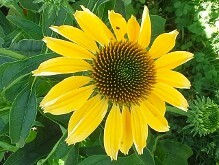 Rudbeckia ‘Prairie Sun’- 21/2'-3', huge single golden flowers, edged sunshine yellow, a happy flower! Salvia ‘Dwarf Blue Queen’- 12"-15", green/grey leaves, deep purple flower spikes late spring to early summer. Deer resistant pungent foliage. NEW Blue Spruce-4"-6", low growing groundcover, blue/green needle-like foliage, fast grower. Carl- 12"-15", small statured, similar habit to Autumn Joy, earlier blooms, dark edged leaves. Matrona- 15"-18", large light marroon leaves, light pink flowers in late summer/fall. 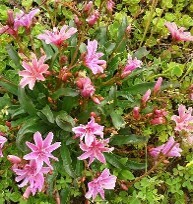 NEW Lidakense- 6"-12", grey leaves,low groundcover, pink flowers in late summer/fall, a favorite of many gardeners. Neon- 12"-15", glowing purple/pink flowers, earlier than ‘Autumn Joy’, a selected sport of ‘Brilliant’. Butterfolies love it, and most other Sedums also. NEW Sunsparkler Hybrids- compact low growers, purple, grey, or variegated foliage. Stachys’Helene von Stein’-Lamb’s Ears-large, soft, wooly leaves, silver-grey, fun to touch. Deer resistant, good grower for well drained, hot and sunny locations. ¥ Thalictrum rochebrunianum-'Lavender Mist' Meadow Rue-4-6’, lilac purple fl., blue/green leaves., sun/part shade, deer resistant. Tricyrtis ‘Miyozaki Hybrids’-Toadlily-2-3’ arching stems, moist shade, purple speckled orchid-like fall flowers. Rosemary ‘Madeline Hill’-very hardy variety, has proved winter hardy here for many years, We've replenished our stock! Salvia elegans-Pineapple Sage-4-5’, aromatic lvs., red fall fl. Carex 'Ice Dance', 12"-15" shiny arching leaves, variegated, slow spreader, graceful and charming. Carex morrowi Green leaved form- evergreen, same as above, but glossy deep green foliage. N Chasmantium latifolium- Northern Sea Oats- 2'-3', sun or part shade, upright form, delightful fall seedheads, great for dried arrangements, seashore tolerant. Hamlen’-Dwarf form,2'-21/2', late summer plumes, most prevalent grass in garden use. ‘Little Bunny’-Miniature Fountain Grass-12",our own selection, smallest and cutest Fountain Grass in the world. Hakonechloa macra aureola-Japanese Golden Grass- 18"-24", 2009 Perennial of the Year, golden variegated groundcover, part shade. Graceful arching habit, velvety golden foliage. Slow to mature size, well worth the wait..
Maiden Grass-6-7’, narrow, graceful leaves, copper flowers. Robust, large grass, second most popular grass. NEW Scirpus zebrinus- Zebra Striped Scouring Rush, 2'-3', upright green and white striped cylindrical leaves. Native. Moist/wet soils. NEW Typha angustifolia- Narrowleaf Cattail- 4'-5', native, narrow leaves and narrow cattails. Wet/very moist ground. Native to wetlands, losing much its territory to Phragmites grass. New Caryopteris 'Snow Fairy'- 21/2'-3', bold white variegation on leaves, blueflowers late summer-fall, butterflies love the flowers! NEWClematis Sweet Summer Love- a much earlier blooming Sweet Autumn Clematis with violet pink flowers and the same strong sweet scent, very new! ¥ Deutzia gracilis ‘Nikko- 15"-18", low arching foliage, white spring flowers, burgundy fall color. NEW Invincibelle Spirit II- huge pink flowers, strong stems to hold the flowers upright, , blooms on new wood, ($1.00 of each plant sold to nurseries is donated to The Breast Cancer Research Foundation.) Truly a beautiful plant. NEWSarcococca confusa- Chinese Sweet Box- 2'-3', small slow growing shrub, glossy evergreen leaves, white fragrant flowers in March/April, loves shade, deer resistant, rare. NEWSarcococca humilis- Himalayan Sweet Box- 15"-18", glossy evergreen foliage, fragrant white March-April flowers, black berries late summer/fall/winter, deer resistant, loves shade. ¥ Sorbaria sorbifolia- Tree False Spirea, 6'-8', ferny foliage, large creamy summer plumes, orange fall color. Blanc Double de Coubert- fragrant double white flowers, 1892. Hansa- (Rugosa 1905)- rich double flowers with lovely Rugosa fragrance, large grower.